On a recent trip to Pittsburgh's Ross Park Mall (AKA my new mecca), I wandered into the Bath & Body Works store. I actually worked at one in Cleveland for a summer during college, and rather than cure my love of the brand's aromatic goodies, it seems to have done just the opposite. I seriously can't walk into one without buying at least SOMETHING. And, as per usual, I found my hands full of body washes and scented hand soaps. My favorite purchase of the day was definitely Peach Bellini Gentle Foaming Hand Soap. I'm always intrigued by the foaming hand soaps -- how do they transform from a liquid in the bottle to foam on your hands with just a simple pump? It's fascinating. So I was already predisposed to love this soap ... it's just a bonus that it smells so enticingly delicious. A blend of white apricot and fresh mango combine with juicy peach in a fruity explosion. The scent lingers but doesn't become overwhelming, and it definitely calls to mind thoughts of warm summer evenings and tropical beach vacations. And, thanks to the inclusion of aloe and Vitamin E, your hands will be left feeling soft, smooth and utterly moisturized. I honestly can't get enough of this hand soap. I find myself washing my hands more often than normal just so I can go back for one more pump! Have you tried this hand soap yet? What do you think? Let me know in the comments! 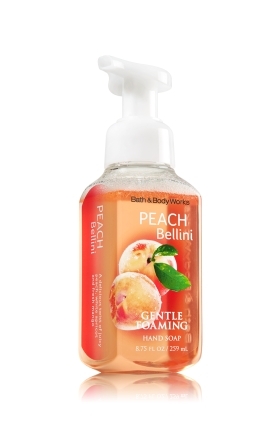 Bath & Body Works Peach Bellini Gentle Foaming Hand Soap retails for $6.50 at bathandbodyworks.com.